Happy Monday! I hope all of you had a good start into this week... Today I'm introducing a new regular column "Made by Hand", where I'll present designers or artists creating wonderful things for us. 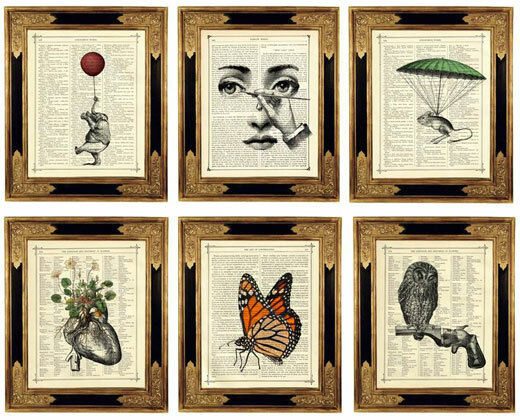 I'm not sure, if it will be every Monday, but at least once a week... For all of us who have a passion for old books and vintage illustrations, the art work from Gina of The Curios Printery is the perfect match. 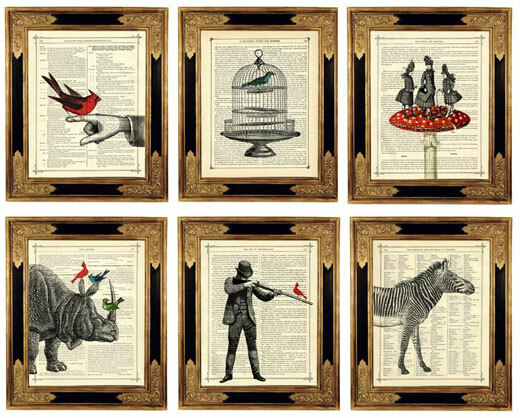 Gina combines pages of old victorian books with unique illustrations and collages. The results are these adorable prints, ready for framing... I'm intrigued by her idea and work, what are your thoughts about Mr. Elephant, Zebra, Butterfly and Co.? I love/want these :) Thanks for visiting my blog! You've got a lovely collection of images here.